2 Factory Parker Projects perts help? Hi there, new to the forum figured this was the best place to ask! I have recently come in to some very interesting "Factory Parkers" I don't really have reason to believe they're fake, if they are, they're very very good fakes! Figure we're all Parker nerds here and I'd love to provide some details on these cool pieces and find out the best ways of finishing them, it's quite hard to find all the parts I need particularly for the tremolo! One is a Parker DF842 apparently. The odd things about this is the "Fretboard" or the section that the fretboard is applied to is only long enough for 22 frets not 24. I can't see any Parkers with these specs so my assumption is that it's a mistake by the factory and thus why it was left around. This one is quite thin (compared to the other one) It doesn't have the rear carbon reinforcement, which I found odd since it's already rear routed, however I think I might be able to bond Carbon to it fairly easily. I have the fretboard for this one the main sticking points are the pickups and the tremolo. Can anyone explain to me how the pickups are to be mounted? The routes are fairly shallow and obviously there is no space for the pickup "ears" I may route out so it's easy to replace pickups (Would this make it more or less desirable?) But I would like to finish it as close as I could to Parker's design. The second one is a bit of an oddity. It's thicker than the other one, has been bonded with Carbon Fibre on the front, and I assume some form of composite on the rear (Though there is no visible Carbon on the back). It has the fretboard applied. The interesting part is it's routed for 1 pickup and a fixed bridge. 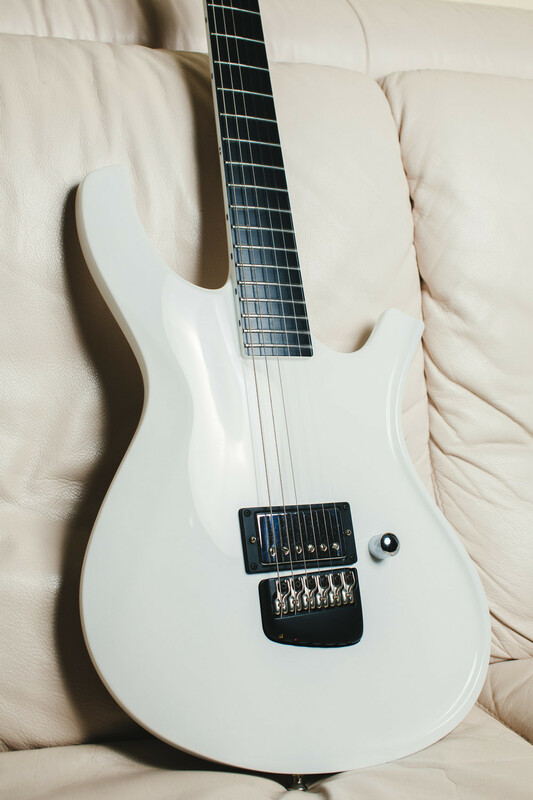 I could only find one instance of this being mentioned and it's a custom shop white one in Paul Ozz's review video. Now he mentioned that the white one he used there is 1 of 2, the other being made for a Parker employee. So Is this true? Is this an elusive 3rd one? This one is much closer to completion I have the bridge, the frets, the nut. However I'm finding it hard to source the 3 pins used for screwing the bridge in? They screw through the back. Anyone got any clues? I've seen various models pop up on Ebay it seems to be when the Washburn factory closed. I'm happy to nerd out over these guitars and learn as much as I can, I've always wanted a parker and now I can have a couple custom ones! Hopefully these pictures work if not I'll leave a link. Re: 2 Factory Parker Projects perts help? welcome! I may have some parts, depending on what you need. pm me, but be advised I don't check in here as often. the ears on the pups are removed and mounted with the pole pieces into a threaded insert, (present in the bridge, missing in the neck). lots of posts here about all that. plenty of room to route the bridge pup, but the neck is very shallow and risky that you'll blow through if you route for ears. I believe all the routing was done before bonding CF to the back. I'm guessing the CF front one is a hard tail, not sure why its thicker. looks like the pup ear routes are there already, so no need for inserts. and for a third one, I have a white DF from 2010/11, so that might be it? be aware there might be some issues that you won't find until you try to mount parts. If you want to unload the one lacking all the CF, let me know! Hey thanks for the reply, The DF842 is listed as 24 frets on Parkers site? I have found some issues already, the CF one has a big crack right in the center of the bridge route, unsure how deep it goes but it isn't through the back so I'll just fill it with some epoxy or something. Both are in pretty rough shape, the DF842 needs the "Freboard base" glued back down and filled on the bass edge side at the high frets, overall they just need some TLC before I'm even at the finishing stages. The CF one is thicker, and the headstock is also longer I'm unsure why, it's the same scale length. Looking at them side by side it's as if the Cf one has a fender 70's headstock haha. I've found most of the tremolo parts but would you happen to know if there is perhaps a schematic or something similar for how it all goes together? I'd like to finish both however if I keep them both I'm unsure hence why I wondered if routing ears for the pickups on the 842 would make it more or less desirable to people buying. That said I have wanted parkers since I played one in my first year of guitar playing, so I'd like to keep one at least. I do know there are 2 on ebay just now though, one in the US one here in the UK. The DF842 is listed as 24 frets on Parkers site? Yes, it is: "The DF842 is identical to the DF824 with the exception of pickup configuration and a full 24 frets." And also in the 2014 catalog. Would anyone know the thread they used for their fixed bridges? I tried an M5 bolt but it's just a little too big I assume they're using some UNF sizing?